If you could do one thing to improve the next generation of British footballers? 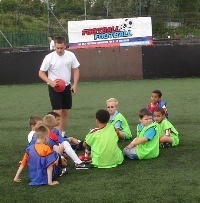 The subject of youth development has been right at the forefront of the grassroots football agenda over recent weeks. How best to develop young talent has been up for discussion throughout the game, from here on Club Website right through to the national broadcast media, including BBC 5 Live's flagship Sport on Five programme earlier this week. There have been some fantastic ideas thrown around and it feels like there's a willingness from across the game to get the problem sorted now, so that the next generation of British footballers are playing on a more level playing field with their European counterparts. So we want to know what one thing you would do to improve the next generation of British footballers. It can focus on anything you like, from the way in which five year olds are taught football to the structure of academies at professional teams in the UK. So have your say in the comments section at the foot of this article. Any suggestion you might have, we'd like to know... anything goes! Jed Roddy (Head of Youth at the Premier League): "We have some outstanding academies and some great technicians and coaches in the system. The one thing I would want to do is unlock 20 hours a week of access time for our young players so that they can work with those coaches and then you'd see the sort of successes that we all dream and aspire to." Ollie Read (Club Website member): "The ridiculous spectacle of under 11s playing 11-a-side on full size pitches. That coupled with poor coaching leads to hoofball football. Kids should play 5 v 5 then 7 v 7, graduating to 9 v 9 on smaller pitches at under 11s. They should not play 11 a side til at least age 14 when they are properly developed physically and technically." Nigel Hargreaves (former Head of Strategic Development at the FA): "We're finding a number of common threads from the professional game right down to the grassroots. What I'd love to be able to do is put those into practice quickly. If we're getting a concensus - whether it's getting more five-a-side football being played or looking at the appropriate time to put leagues into place - a bit of confidence, a bit of leadership and I think these things can be put into place very quickly. That's probably the big challenge over the next six to 12 months." Lee Addison (Club Website member): "Basically it all comes back down to the money pinching of the government. If they want home grown footballers, who work their way through grassroots football then they would develop the areas that need it." Darren Caskey (former England under 18 international): "Five, six, seven, eight year olds - it needs to change there. The technique, the touch, stuff like that. We need to do more with the ball. That's something we've identified and something we definitely do need to change." Barry McGonigal (Club Website member): "We need to get kids out playing the game a lot more. I live in the north of Ireland and I've noticed a dramatic drop in the numbers of kids out playing with friends around their estates. I play myself in local amateur football and even the decline in standards there is bad." Right... so now it's time to have YOUR say! !